The early morning sunshine on this hike was a sign of a great time to come. Valley Way is the access route to Mt. Madison and Mt. Adams most travelled by, and for winter hiking that makes all the difference. 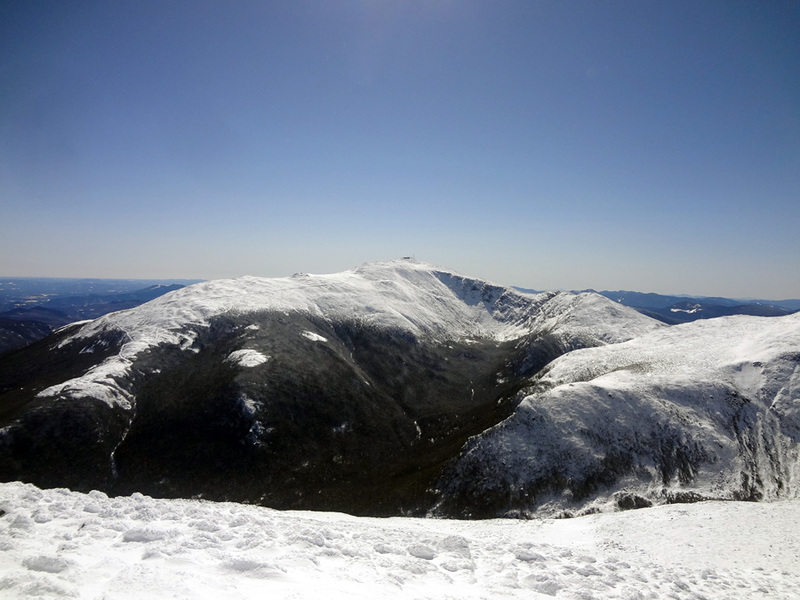 The easiest and most direct route to Madison Hut, hikers come one and all for day hikes to the aforementioned summits, overnights at the Valley Way Campsite or above treeline (winter only), to venture into the Great Gulf for ice climbing, or to begin treks across the Presidential Range. Whatever your pursuit, Valley Way provides a well packed, moderately difficult trail with decent sheltering from wind and other winter elements. The trail begins at the Appalachia parking lot off U.S. Route 2 in Randolph, New Hampshire. The lot fills quickly, so plan to arrive early. A bunch of other trails break off Valley Way in the beginning — notably Air Line and the Fallsway — but the trail is well marked, and in the winter this path is most trodden, so it’s fairly easy to stay the course. Summer hikers will just want to read all signs carefully. Following blue blazes, Valley Way climbs gradually for a good distance, paralleling Snyder Brook in a few locations. A couple miles in the trail gets steeper as it ascends the slopes of Durand Ridge. Breaks in the trees permit partial views of Mt. Madison and Gordon Ridge, teasing the grander views yet to come. Cloaked in an armor of snow, the evergreen trees along the ridge appear as stoic sentinels guarding the mountaintop. The Valley Way trail as it nears treeline. Around the three-mile mark is a short path on the right to the Valley Way Campsite. I didn’t venture over on this trip, but I’ve stayed there in the summer and know it to be a good site. A lot of hard work has clearly been put into leveling off the dirt tenting platforms, but there aren’t many of them so they fill up quickly. Early arrivals should set up on the sides of spaces to allow room for others. Soon after leaving the shelter of treeline, Valley Way ends 0.7 miles after the campsite and within view of Madison Hut. Here is the intersection with the Gulfside Trail and the Star Lake Trail, both of which are also the Appalachian Trail. Just prior to the hut on Star Lake is a junction with the Osgood Trail, which leads to the summit of Mt. Madison. Follow the Gulfside Trail to the intersection with Air Line to get to the summit of Mt. Adams. The weather on this day was remarkable. 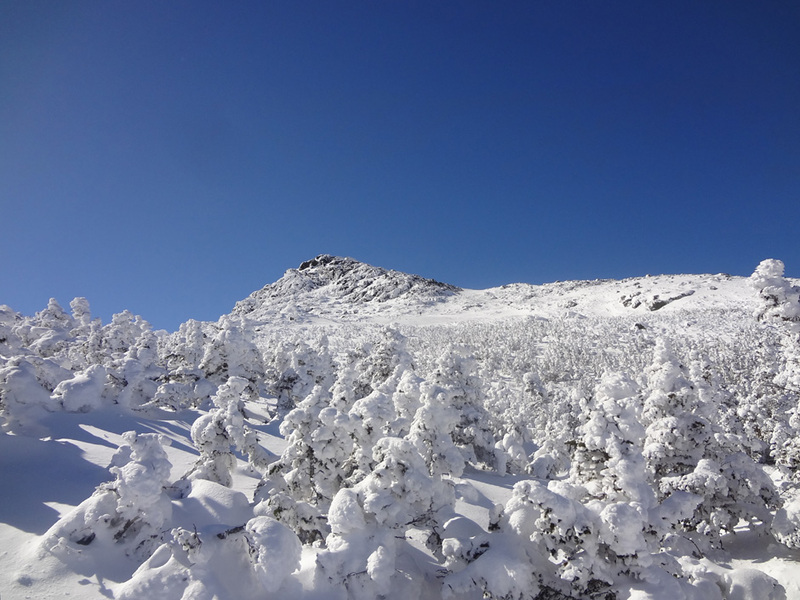 Blue skies and beautiful with temps in the mid twenties at higher elevations with little wind (except on the summits). 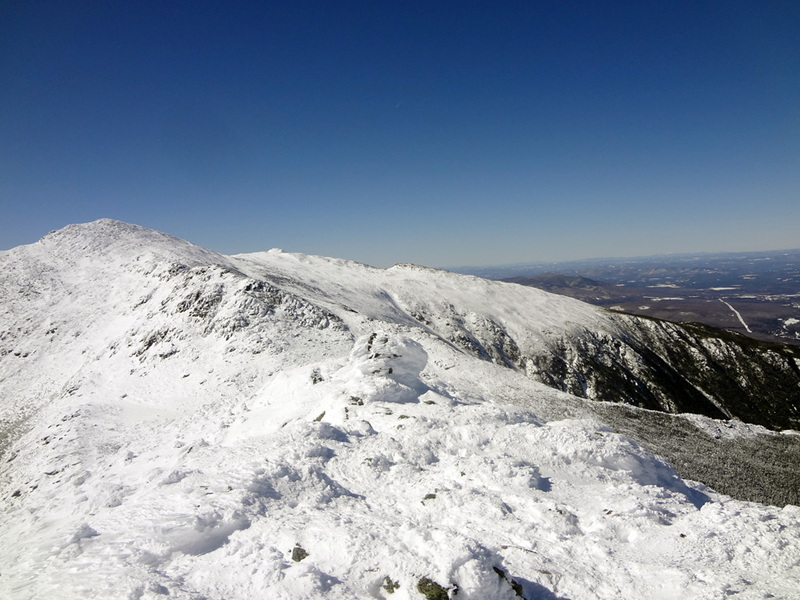 It was a silly question to ask people how they were doing, as everyone was giddy with the good fortune to be winter hiking in the Presidential Range in such conditions. This sign had the day off. Looking up at Mount John Quincy Adams from the treeline on Valley Way. So…I left the snowshoes in the car thinking the ground would be windswept and exposed above treeline. This sign shows how wrong I was. Approaching the Mt. Madison summit. The wind did pick up considerably here, but I was able to manage in a soft shell without digging out the goggles and balaclava. Mt. Washington as viewed from near the summit of Mt. Madison. Looking down on the Appalachian Trail descent of Osgood Ridge on Mt. Madison. The Carter-Moriah range is in the background. 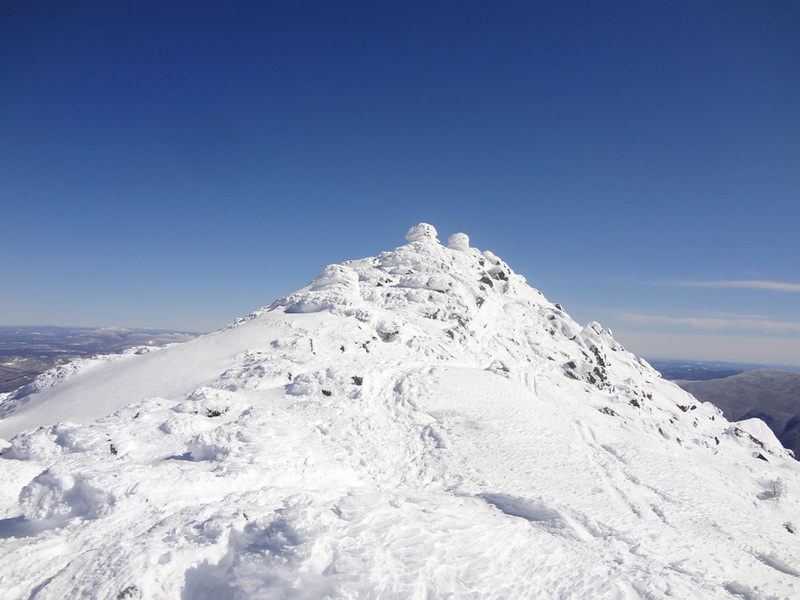 A cairn near the summit of Mt. Madison covered in rime ice. Mt. Adams as viewed on the descent of Mt. Madison. Mt. Madison as viewed from the ascent of Mt. Adams. The Air Line ascent of Mt. Adams. Mt. Washington as viewed from the summit of Mt. Adams. Mt. Jefferson as viewed from the summit of Mt. Adams. 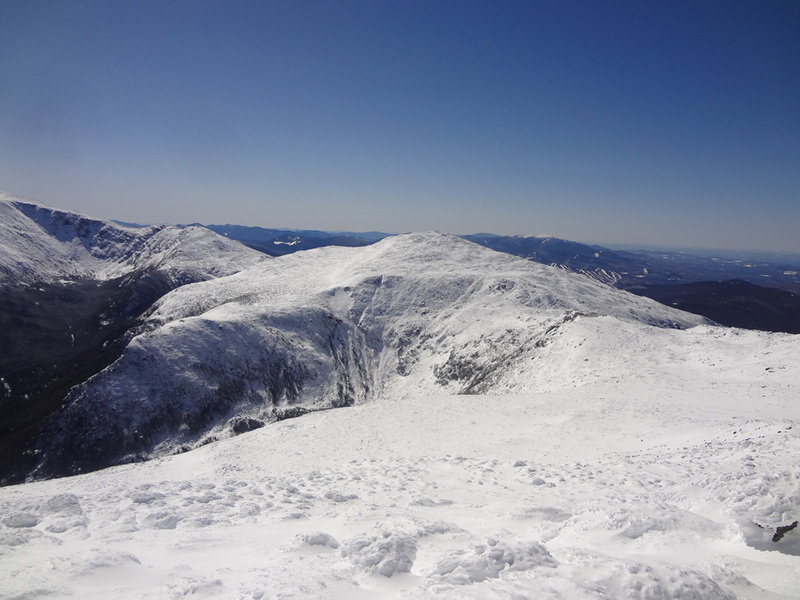 Wildcat Mountain and the Carter-Moriah range as viewed from the summit of Mt. Adams.